Service is one of the most important aspects of our business. Our staff are trained in the latest technical advances in bikes, components and accessories. If you have a question on anything having to do with the function or performance of your bike, we can answer it. If you need service, from scheduled maintenance to a complete overhaul, we can handle it. This price is for what other shops call a “performance tune.” We offer more service for a lower price than any of our competitors. If you’ve waited to the last minute and you need it next day. These are limited to when one of our mechanics can stay after-hours. They get paid extra for doing so, because they deserve it. For when your old (and sometimes new) bike needs extra love. Includes install labor for new parts, a deep cleaning, bearing re-packing (when needed), and tune up. A popular option for restoration projects. We offer higher quality alternatives to many of the expensive brands you’ll see around town. We are unimpressed with hype and advertising gimmicks so rampant in the cycling community. Instead, we test products from a wide range of manufacturers and only recommend them if they perform up to our expectations. We stock bikes from Jamis, Haro, MASI, Raleigh and more! With every bike you purchase you get free adjustments for one year, 20% off all bike accessories and parts, and free professional in-store fitting(a $50 value). Our goal is to guide you to a product you will love, and provide the service to keep it rolling for a lifetime. Are you 6′ 6″ or 5′ 2″? A good shop will help you find the right fit, even if you’re not buying an expensive custom bike. Fitting a bike to a rider is an important process that directly affects the ride quality and comfort of a bike—but it’s one we can’t tackle online. The only way to be certain of the right size is to visit us. Our bike pros are skilled at bike fitting and will help find the appropriate bike and size to fit your individual needs. Each person’s physical dimensions and attributes (arm, torso, or leg length; flexibility; skill level; etc.) are slightly different. People of the same height are often fitted to bikes with different frame sizes, and will often fit a range of sizes depending on the type of bike; the make and model; and the desired use of the rider. We’ve been on missions, we know what missionaries need! Missionary bike purchase includes two years free service. Order through Highlander Bike Shop. Looking for the needle in a haystack? Normally we would tell you to bring your bike in so we can use our knowledge and training to assist you; however, if you like scrolling through every possible option available these catalogues will be a helpful resource. Sometimes we also like to look up random parts and dream of the crazy ways to customize our bikes to ride better or look more unique. A New England native, Doug traveled west to attend the University of Utah. He fell in love with this state and never left. As an avid cyclist, skier, climber, outdoors-man, and skilled mechanic, Doug has strived to combine his love for all the beauty he discovered in Utah into a business. He opened The Highlander in December of 1978. We like to say we became established in 1979, because that’s when it really took off. 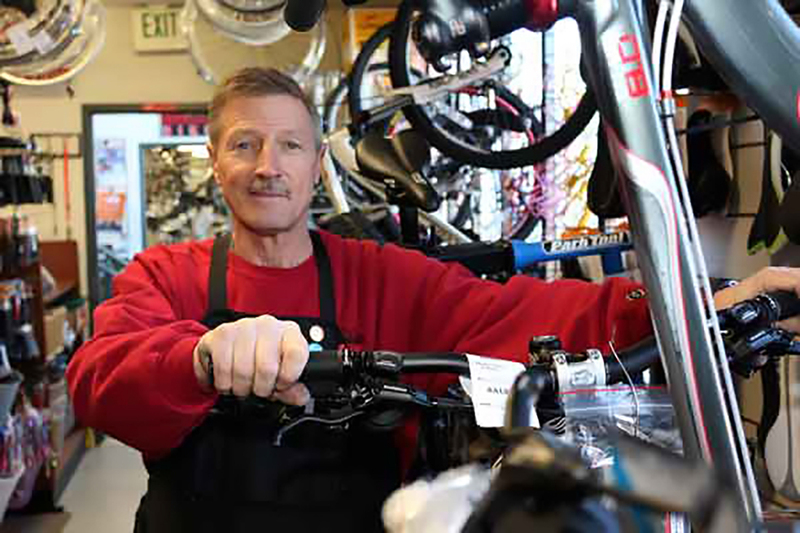 Today the family business prospers due to a cadre of loyal customers who appreciate Doug’s friendly and practical advice, years of experience riding and wrenching, and his old-school style of fixing things rather than just replacing them. Son of Doug. 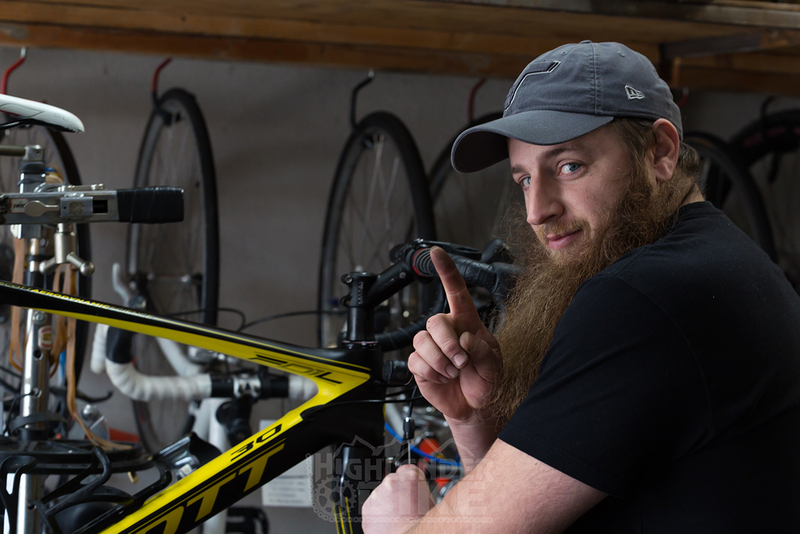 Max started in the bike shop at a young age, and credits his expert mechanical abilities to the many other skilled mechanics he has had the privilege to learn from over the last 20+ years. He is a self proclaimed clydesdale (although he’s not a racer), and can often be seen riding his giant goofy custom trike through the streets of Salt Lake. Like his father, Max prefers to give practical advice based on his years of experience, rather than try to just sell the most expensive thing in the shop. This, combined with his generally friendly attitude, has earned him a loyal following of competitive and non-competitive riders alike. In the future, when we have time to blog, this will be where our blog will be. © 2019 Highlander Bike Shop. All rights reserved.